Galant VR-4 Forums » Galant VR-4 » General VR4 Discussions » Wanting to create a tubular front crash beam? Wanting to create a tubular front crash beam? I've tossed this idea around for a while. Mainly this was brought on by an old roommate who almost totaled his subie by kissing a civics rear bumper at under 10 mph. it did quite a bit of damage to the front. Now I know the norm with alot of people is to hack up the factory crash beam or remove it all together. This is something I've never been comfortable with. I had a jdm rear on my Evo and I had the rear crash beam made to fit. Now I've been considering making a crash beam that would still function close to what the factory one would. I also want to make one as a proper means of mounting the bumper cover, foglights, and FMIC. I am planning on keeping the USDM bumper covers. What I'm wanting to do is take the dimensions from a factory crash beam and get a basic design. Just wondering if anyone has done something close to this or would have the dimensions for this. 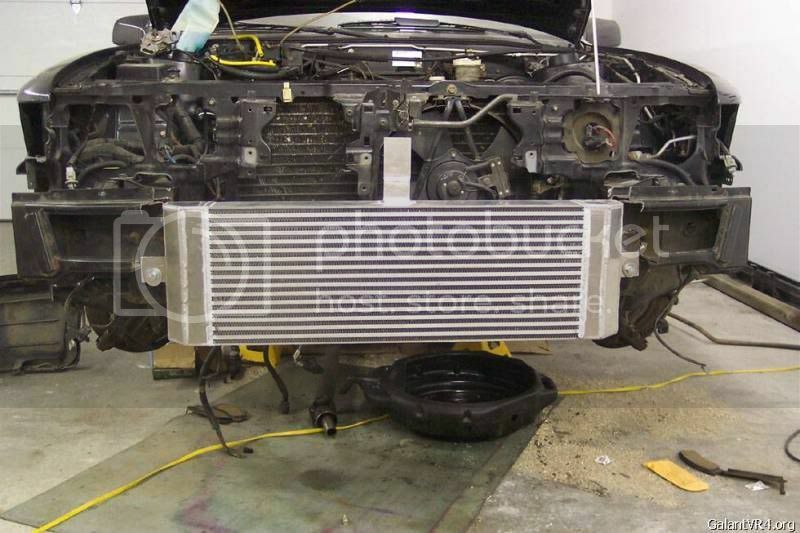 This is the FMIC I plan on using. This is my roomies car. before and after. Now I know they used chromoly for the beam. Ouch and ouch. I can't help you with dimensions but if you can make this into reality you could probably turn a profit. I like the idea, although sometimes when you put something too rigid there, it ma have a tendency to 'push' the energy farther down the chassis somewhere else and cause more damage then without. However, if we're talking 5 mph bump, maybe not such an issue; just something to keep in mind is all. That's why I like aluminum, cause it gives way easier, yet offers some protection. This pic is a friend of mines car- Jason L. (CKA on here) He had that IC custom made to fit the vr4. So if you are planning to use that particular one PM him to see if he still has the specs for having it built if you want the same one. ^^^^ That FMIC is sitting in my basement now. I bought it a while ago. Yeah I know the chromoly was alittle overkill. I've debated on what to use. Aluminium was definitely something I've considered. I thought about possibly doing a small run. The only issue is that I'm not positive on the clearance between the usdm and jdm bumper covers and the FMIC everyone uses is not the same. Someone on here had a really really nice internal chromoly bumper support for a rally Galant VR4. It even had protection bars for the front mount. I have the pictures somewhere I am sure. Probably on my spare lap top at work! I will try to dig them out. Thanks Paul that would be a big help. I can understand wanting something sturdier in the rear, because you're quite reliant on other people not to run into you, but at the front... wouldn't it be easier to just increase your following distance by a couple of car lengths? (and pay attention). maybe if you still have abs it's best to prepare for the day that thing refuses to stop & shoots you forward at a light. well it's not so much that as I just want something there instead of hacking up the factory crash beam or removing it completely. It's not that I'm worried about hitting someone. I just know the consequences of running without support up front. Someone should check to see if this will work on a gvr4. I have one of those laying around, but my car is still at the paint shop. I don't think that the jmfab support would really help you out at all (even in an extremely low speed impact). It simply helps provide attaching points for saggy front bumpers with removed their bumper supports. Ok let me clear this up since I feel I'm not making myself clear. #1 I want to be able to mount the bumper cover, FMIC, and foglights on this setup. I have a JDM bumper for mine and I'm going to use a Volvo or a BMW aluminum bumper as a front bumper starting point. Already have it but can't remember what year or body it came from but it does have a radius to it on the ends. CH4522 0049 is the part number on it. If your going to do aluminum it needs to be an extrusion or a c channel that started as a bumper before. Mine is an extrusion and a rectangular piece with a center divider in the middle running parallel to the ground. As for the shock to the chassis the factor bumpers didn't have dampers here in the US but couldn't hurt having them. Hit a nice junkyard and shop the european section, there's some nice pieces if you look around and most have dampers bolted to them. If you remove the bumper mounts from the US cars the subframe is open and will be easy to install a damper inside. the one on that drift car might do the trick. I'm in on a group buy for this. Yeah but those darn trees just can't drive, they swerve right into your lane! That is very sick. I am in on the buy. One of my bumper mounts is trash anyway. Terrance, I'll let you know how it goes. I'm gonna talk to this shop near me about doing this. They used to build alot of drag cars. the one on the 240 was nasty I would love to get one like that. I have already been hit in my vr4 so that would just be a little payback for who ever hits my car. Damn old people and vans. Generated in 0.571 seconds in which 0.526 seconds were spent on a total of 15 queries. Turbo powered.